Game Start kicked off its 4th year with an amazing display of game exhibits, esports, consoles, board games, indie games, doujin booths, "Game On" cosplays and more. Held on 14-15 October 2017 at the Suntec Convention Centre, the sprawling 6000sqm halls was grand and spacious. 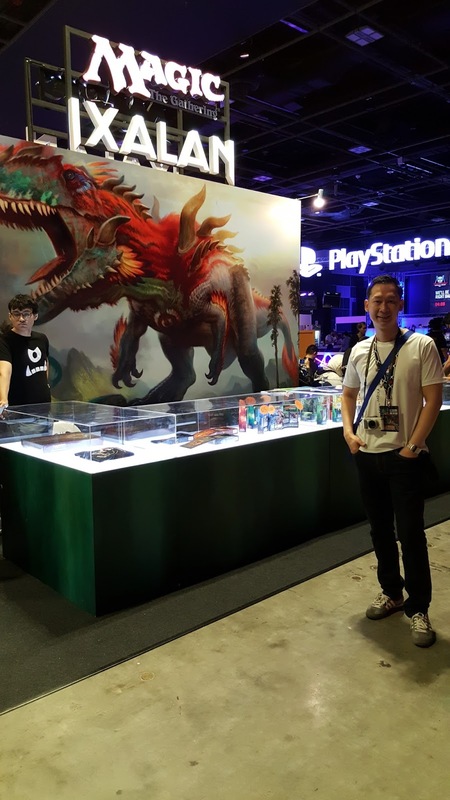 If you had visited the recent STGCC, you would think that Game Start magnified the Gaming section and then offered you more. 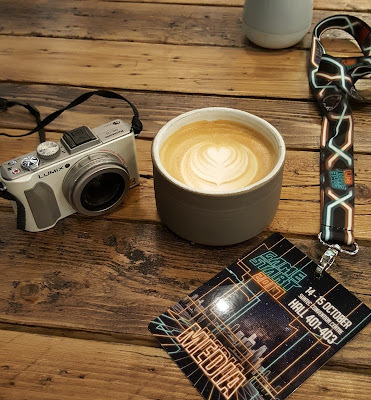 This year, Game Start introduces two new sections - GameStart TableTop for all board, card and dungeon master needs, and The Drinkery, a cyberpunk-themed lounge area with food stalls and bar. Key content partners include South East Asia Major, Doujin Market, PlayStation, Cygames, HADO, Wizards of the Coast, Artblovk, Grey Ogre Games, Xmashed Gear and more. 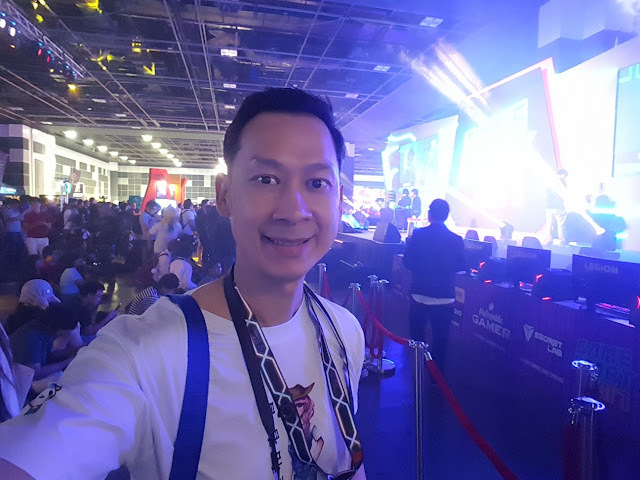 Since it was my first time covering a major Gaming convention, I had this presumption that it would be a deafening environment with all kinds of gaming effects/sounds but I was wrong. It was actually comfortable to walk into every areas of the convention, soak in the cosy atmosphere and speak without raising my voice. The organiser must had tested and done everything right! Let's dive in to the pictures to capture the exciting moments. The first thing I saw when I stepped inside. I was amazed by the grand stage. There was live-action gameplay of "Guilty Gear". The kaleidoscopic of neon lights and lasers attracted me to them like a hypnotized kangaroo onto incoming cars. Virtual Reality is a big thing now. What you see inside the goggle translates into real life movements. I may get one of these from Playstation, although I'm not an early adopters of tech stuffs ^^. This is a cute credit card size 8-bit gaming console made in the U.S called Arduboy. I was intrigued by the slim design. They have about 100 downloaded games currently. This too gets into my "To-buy" list. Yes, smartphone games doesn't satisfy my craving for quirky retrolicious games. I was told by the sales representative that the only shop in Singapore that sells these is Toytag in Harbourfront. 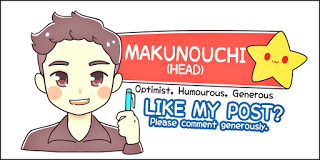 A team of 4 Indie Taiwan game developers designed this cute game called Mokai Adventure. 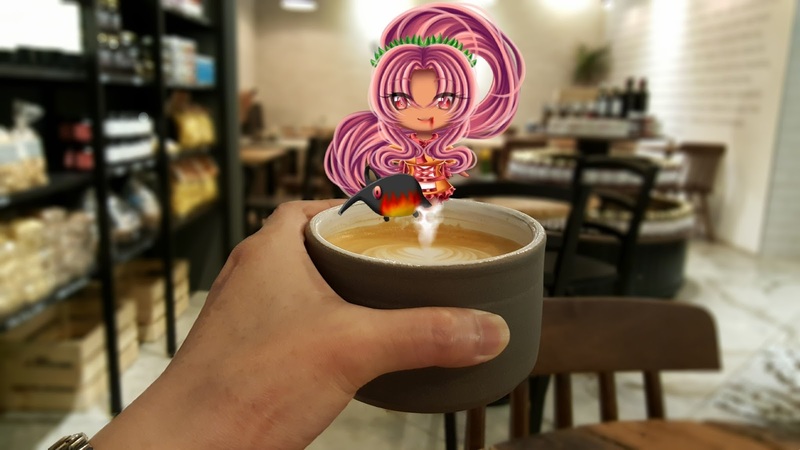 Through AR technology, Mokai Adventure uses cards to summon MoKais in the real world and experience the cute MoKai fighting along your friends. Those who enjoy a combination of traditional and mobile games and playing alongside your friends will love this game. I love Doujin booths! ^^ They were tucked neatly in one section of the hall. Oh, why were they using lights? Because the hall wasn't bright enough. But these lights added a touch of coziness to the event. Anyone of you still have this boxy retro CRT television? These scene made me reminisced my "Counter Strike" days where I spent 10 hours in Bugis Cyber Cafe and made some friends. The thing about MMORPG games is that it gets so realistic that it was funny seeing my infuriated friend stood up in his seat and wanted to bash up another as the other person kept "flashing" the whole team with flashbang ^^. At this point, I was famished and I needed more fuel. Off to get lunch and then a cuppa of coffee at Ergon Deli Cafe just below Suntec City Mall. I added Tomoko (Coffee Genie) Halloween version digital stamp to my cuppa of latte. If you are a coffee drinker and love anime, email me for the free stamp to spice up your photos. Back to the past when I hung around arcades to play "Space Invaders" and "Pacman" in those super bulky game machines. The futuristic state-of-the-art Grand Turismo capsule. The kind of machine which Asuka Rie loves. At 4pm, the "Game On" cosplay competition commenced with amazing outfits of characters from Diablo, Overwatch, Leagues of Legend and more. The hall space was just right and logistical arrangement was good. The sound wasn't deafening but (to nitpick here) I feel the lightings on certain sections of the hall was a little dim, especially the Doujin area. And people need to see what they are buying ^^. Overall, there were good camaraderie and sportsmanship among the people visiting the event and I look forward to visit them again in 2018! No Comment to " Game Start 2017 "